About "Arithmetic Sequences and Series"
An arithmetic sequence is a sequence in which the difference between each consecutive term is constant. An arithmetic series is the sum of the terms of an arithmetic sequence. Is the sequence arithmetic ? If so, what is the common difference ? What is the next term in the sequence ? This is a sequence, a function whose domain is the Natural numbers. Create a table that shows the term number, or domain, and the term, or range. An arithmetic sequence is a sequence with a constant difference between consecutive terms. The difference is known as the common difference, or d.
In an arithmetic sequence, each term can be represented by f(n) where n represents the number of a particular term. Let us consider an arithmetic sequence where the first term is 3 and the common difference is 5. 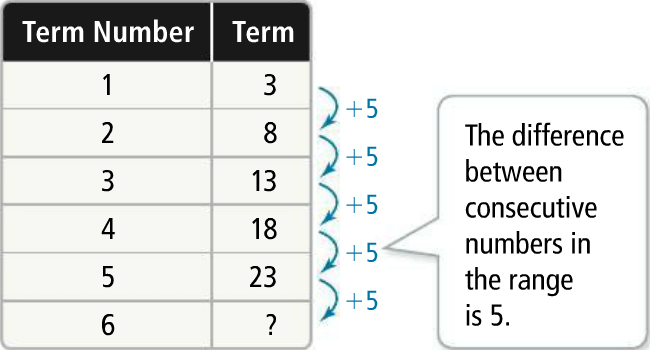 If n > 1, each term is the sum of the previous term and the common difference 5. This is the recursive definition for an arithmetic sequence. Each term is defined by operations on the previous term. In the notation shown above, the subscript shows the number of the term. Is the sequence 7, 10, 13, 16, ........... arithmetic ? If so, write the recursive definition for the sequence. In the given sequence, difference between any two consecutive terms along the sequence is 3. So, this is an arithmetic sequence. What is an explicit definition for the sequence ? allows us to find any term in the sequence without knowing the previous term. What is the recursive definition for the arithmetic sequence ? A high school auditorium has 20 seats in the first row and 35 seats in the sixth row. The number of seats in each row forms an arithmetic sequence. A. What is the explicit definition for the sequence ? B. How many seats are in the thirteenth row ? Write the general explicit formula. Subtract 20 from each side. Divide each side by 5. So, each row has two more seats than the previous row. We have to find the number of seats in thirteenth row. So we have substitute 13 for n.
Hence, there are 56 seats in thirteenth row. What is the general formula for an arithmetic series ? A finite series is the sum of the terms in a finite sequence. A finite arithmetic series is the sum of the terms in an arithmetic sequence. For the sum of n numbers in a sequence, we can use recursive formula or simply add the terms. To find the sum of a series with many terms, we can use an explicit definition. To find the explicit definition for the sum, use the Commutative Property of Addition and reverse the order of the terms in the recursive series. Add the two expressions for the series, so we are adding the first term to last term and the second term to the second-to-last term, and so on. Divide each side by 2. Find the value of n.
Write the general formula to find the sum. Hence, the sum of the terms in the given arithmetic sequence is 6960. After having gone through the stuff given above, we hope that the students would have understood, "Arithmetic Sequences and Series".